Climate Reanalyzer obtains all original model output from the NOAA Operational Model Archive and Distribution System. Forecast maps on this page are generated using NCAR Command Language (NCL). These visualizations are for educational purposes. Always refer to official guidance from the National Weather Service and NOAA for decision during severe weather. The variable Temperature 2m Anomaly is available for the GFS model. Temperature anomaly (at 2 meters above the surface) refers to the departure of the current forecasted temperature from a climate baseline. Climate Reanalyzer uses a 1979-2000 climate baseline derived from the reanalysis of the NCEP Climate Forecast System (CFSR/CFSV2). 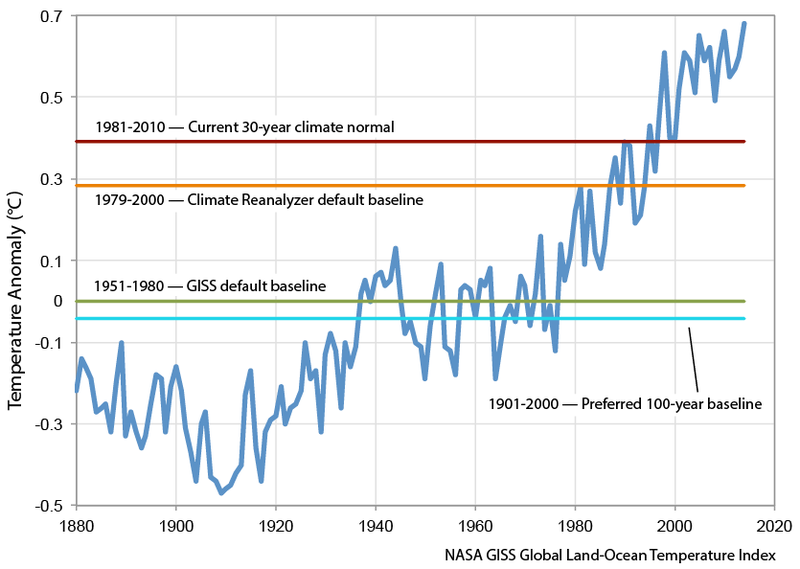 This baseline is chosen over the more typical 1981-2010 climate normal for the simple reason that it better approximates historical climatology, as shown here in relation to a 1880-2014 global land-ocean temperature index from NASA GISS. GFS temperature anomaly maps for the World, Arctic, and Antarctic display at the right of the image a list of area-weighted average anomaly values for the World, Northern Hemisphere (Eq-90°N), Southern Hemisphere (Eq-90°S), Arctic (65°N-90°N), Antarctic (65°S-90°S), and Tropics (25°S-25°N). Note that GFS has a systematic model bias in which diurnal extremes are greater than in CFSR/CFSV2 over some parts of the globe. Correction terms are therefore be applied to each region of interest in order to bring GFS into better accord with CFSR/CFSV2. 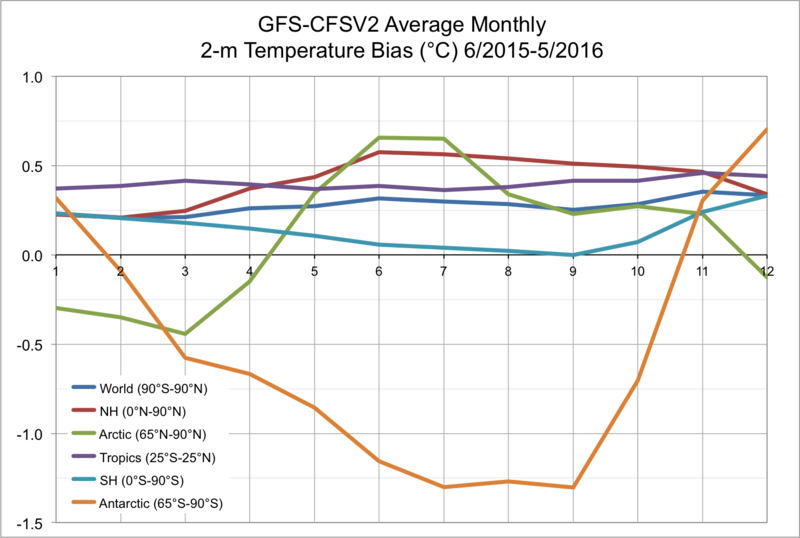 These terms are calculated from the mean monthly temperature differences between GFS and CFSV2 for the period June 2015 to May 2016 (see here). 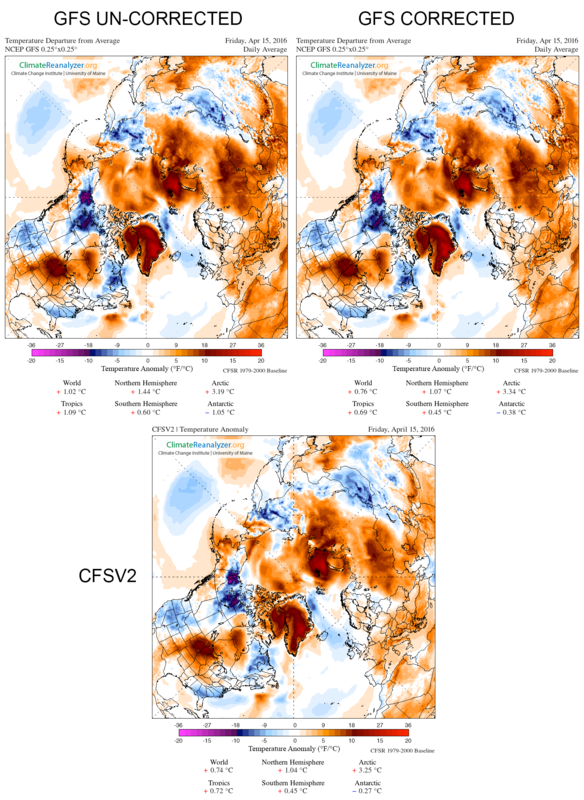 A comparison of uncorrected and corrected GFS vs. CFSR/CFSV2 temperature anomaly maps is shown here. The resultant bias-corrected GFS-CFSR temperature anomalies will differ somewhat from those calculated entirely within the CFSV2-CFSR framework, but in all this method affords reasonable temperature anomaly estimates for the GFS forecast period. The most reliable temperature anomaly estimates, CFSV2-CFSR, can be found in the Daily Reanalysis Maps image archive. The daily reanalysis archive is updated once or twice per month. See this NCEP/NWS discussion for additional information on model bias. This website is produced by the Climate Change Institute at the University of Maine. Our institute has more than a 40-year history of polar exploration, and research contributions to glaciology, climate science, and anthropology. Climate Reanalyzer utilizes and provides access to existing publicly-available datasets and models. Original data sources are provided on the Available Datasets page. "[Data/Image] from Climate Reanalyzer (https://ClimateReanalyzer.org), Climate Change Institute, University of Maine, USA." We make every effort to provide datasets and visualizations that are accurate and error-free. Report bugs to the contact e-mail below. E-mail reanalyzer@gmail.com or visit Climate Reanalyzer on Facebook. Please know that we cannot accept special requests for new site content per limited human resources.